Weaver’s bottom (ischial gluteal bursitis). • Swelling, especially if bursa is superficial (olecranon, prepatellar). • Local tenderness with pain on pressure against bursa. • Pain with joint movement. • Palpable occasional fibrocartilaginous bodies (most common in olecranon and prepatellar bursae). • Many bursal sacs “dry up” eventually. • Nonsurgical treatment is effective in most cases. 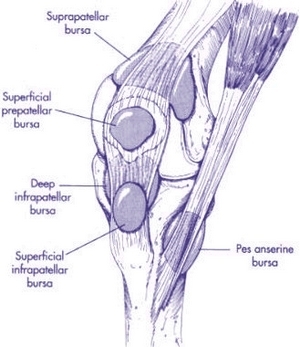 Bursitis is inflammation of a bursa, which is a thin-walled sac lined with synovial tissue. The function of the bursa is to facilitate movement of tendons and muscles over bony prominences. Excessive frictional forces from overuse, trauma, systemic disease (e.g., rheumatoid arthritis, gout), or infection may cause bursitis. Subacromial bursitis (subdeltoid bursitis) is the most common form of bursitis. The subacromial bursa, which is contiguous with the subdeltoid bursa, is located between the undersurface of the acromion and the humeral head and is covered by the deltoid muscle. Bursitis is caused by repetitive overhead motion and often accompanies rotator cuff tendinitis. Another frequently encountered form is trochanteric bursitis, which involves the bursa around the insertion of the gluteus medius onto the greater trochanter of the femur. Patients experience pain over the lateral aspect of the hip and upper thigh and have tenderness over the posterior aspect of the greater trochanter. External rotation and resisted abduction of the hip elicit pain. 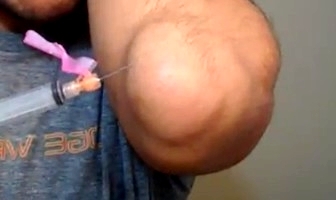 Olecranon bursitis occurs over the posterior elbow, and when the area is acutely inflamed, infection or gout should be excluded by aspirating the bursa and performing a Gram stain and culture on the fluid as well as examining the fluid for urate crystals. Achilles bursitis involves the bursa located above the insertion of the tendon to the calcaneus and results from overuse and wearing tight shoes. Retrocalcaneal bursitis involves the bursa that is located between the calcaneus and posterior surface of the Achilles tendon. 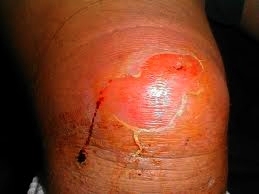 The pain is experienced at the back of the heel, and swelling appears on the medial and/or lateral side of the tendon. It occurs in association with spondyloarthropathies, rheumatoid arthritis, gout, or trauma. Ischial bursitis (weaver’s bottom) affects the bursa separating the gluteus medius from the ischial tuberosity and develops from prolonged sitting and pivoting on hard surfaces. Iliopsoas bursitis affects the bursa that lies between the iliopsoas muscle and hip joint and is lateral to the femoral vessels. Pain is experienced over this area and is made worse by hip extension and flexion. Anserine bursitis is an inflammation of the sartorius bursa located over the medial side of the tibia just below the knee and under the conjoint tendon and is manifested by pain on climbing stairs. Tenderness is present over the insertion of the conjoint tendon of the sartorius, gracilis, and semitendinosus. Prepatellar bursitis (housemaid’s knee) occurs in the bursa situated between the patella and overlying skin and is caused by kneeling on hard surfaces. Gout or infection may also occur at this site.